The FA Cup Final, Wembley Stadium, 16th May 1987. It is the 62nd minute, and Gary Bennett of Coventry City sends a pinpoint cross into the penalty area. Keith Houchen launches himself full length at the ball and sends a spectacular diving header crashing into the back of the net, past the hapless Ray Clemence in the Tottenham goal. This was arguably the greatest moment in the history of Coventry City Football Club, and the defining moment in a 3-2 victory which saw Coventry win their first ever major trophy (and only one to date). Thirty-four years on however, the picture is looking somewhat more bleak for the Sky Blues. Since the 1987 Cup victory, the club’s demise has perhaps been even more spectacular than Houchen’s header itself. The club has been relegated to League One with a shoestring squad, is riddled by crippling debt, is merely a tenant in it’s stadium and has gone through 10 managers in the last 11 years. So what has gone wrong for Coventry? From an outsider looking in, everything would suggest that Coventry should be at least a top level Championship side. A state of the art new stadium, a club of decent historical stature and most importantly the only major club in a City of 300,000. It is all in place for Coventry to be a success, and for a while they were. Coventry stayed in the top flight of English Football between 1967 and 2001 without being relegated (that’s 34 years for those of you too lazy to do the maths) and as aforementioned won their first major trophy during that period. When they were relegated only Arsenal, Everton and Liverpool could boast longer tenures in England’s top flight. Coventry were essentially an established Premier League unit and able to attract bigger names, and due to a few hair-raising relegation battles they invested heavily in the team. Players were brought in for big money- Robbie Keane signed for £6million, Craig Bellamy for £6.5million, Mustapha Hadji joined from Deportivo for £4million and even once they were relegated in 2001 to what was then Division One- they were still prepared to pay £5million for Lee Hughes from West Bromwich Albion. Couple these amounts with the large wages (which had just begun the astronomical rises to the crazy wages today) you have a large amount of money leaving the club. Whilst this may have been seen as sound investment at the time, spending such large amounts of money on players would prove disastrous when Coventry were relegated in 2001- when the club frankly did not have the income to support the amount spent on players. Then the even bigger issue- the stadium move to the Ricoh Arena. 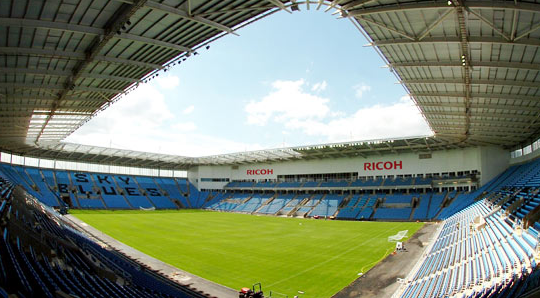 Again, the stadium move to the brand new Ricoh Arena from the club’s traditional ground Highfield Road (home to Coventry for over 100 years) was based on the presumption that Coventry would be a Premier League side for the move. They weren’t and the club therefore has struggled with the financial burden of the Ricoh ever since. Perhaps a promotion to the Premier League would ease the financial pressure, but they have never really threatened to do so (the highest they have finished in the league since 1970 is 7th) and it certainly does not look likely any time soon now. Thusly, the snares of financial crisis slowed tightened on the club- as parachute payments stopped and Coventry struggled to pay the £1.2million annual rent to the tenants of the Ricoh Arena, Coventry City Council (who funded the building of the Arena). The crisis worsened and worsened, peaking in 2008 when the club were facing administration and potential liquidation, until London based investment group Sisu stepped in and brought the club. With the club at this point losing over £500,000 a month and in dire straights, Coventry supporters would have been forgiven for thinking that Sisu would be the clubs saviors. However they have proven to be the absolute antithesis of this. This is a crystallization of years of mismanagement.The present owners underestimated the huge responsibility of taking over a football club. Worse still, with debt racking up and the club’s very existence being increasingly questioned, the owners seem to have gone into some sort of self-induced exile. There has been a consistent failure to file financial reports to the relevant authorities, rent is not being payed and most worryingly of all, nobody actually knows who “Sisu” are, and the owners of the club remain anonymous and unknown to the public. The amount of information that is undisclosed to the public is worrying and does not bode well. The club is now in a reported £60million of debt, with a tiny amount of income (the club receiving no money from the stadium- which it does not own and only meager amounts from competition bonuses) and towards the back end of last season finally went into administration. The mess that the club’s administrators face is of monumental proportions- with the owners of the club not even 100% clear, let alone a financial solution. Because of the enormity of the rent, the club is looking at the prospect of the club actually leaving Coventry to ground share with Walsall. Surely the club leaving the city altogether would be the final blow? Clearly the club is in desperate need of new investment. There is reported interest the world over- as people can clearly see the Premier League potential of this seemingly dormant football club, that is if the club survives that long without having to liquidate. The most promising of these prospects looks to be in the form of American Property Tycoon Preston Haskell, who is willing to wipe the clubs debts and invest in the club heavily. If they cannot return Coventry City into a successful club, they should go now and let others pick up the pieces. City fans must pray that a sound investor does come in and pick up the pieces, and end this 13 year long nightmare. It is deeply saddening for me to watch a massive club like Coventry fade like this, but you hope this is as bad as it gets for the Sky Blues. With a mixture of poor and unlucky investment, horrible timing of relegation and Sisu’s mysterious and seemingly cancerous leadership the club is in dire straights. The despondent players that left the pitch on the last day of the season back in May are of stark contrast to the triumphant heroes of the Sky Blues of old, such as Jimmy Hill and Keith Houchen. The club seems to be dying a slow and painful death but its plight is not irreversible. Child of the Football Manager generation. Football writer for backpagefootball.com, soccersouls.com, albiontillwedie.com and Metro Sport amongst others. GARY Bennett crosses for Houchen’s header ??? There is a lesson to be learned here, how can a club function when it doesn’t own the stadium or match day revenue? What are the assets of the club? overpaid, under performing players that are basically worthless! The Alan Higgs Trust & CCC have made an horrific business decision that will haunt them for years to come, best thing that could happen to Coventry City FC would be to declare bankruptcy and start a fresh. 34 years ago? That makes it 2021 now! Have I somehow gone to sleep and woken up 8 years later? Seriously though, it is a sad time. Years of mismanagement have led us to this. I can see what the current owners are trying to achieve but feel that they way they have dealt with it has been wrong. It has led to the loss of a large proportion of the fans and a relegation to the third tier of English football. I just hope that a radical change to the way the football club brings in income can be beneficial. I certainly won’t hold my breath though as feel we aren’t anywhere near the lowest point in the curve before it improves. A great read as ever Josh. Saddens me to see as a local guy a club like Cov in such an awful state. Hope this American’s bid is genuine. The clubs fans deserve better than what they are getting. exactly what is wrong with the modern game. bad financial decisions have led to the downfall of what is a fantastic football club, and frankly sisu are a disgrace. from a neutrals perspective i hope this is as bad as it gets. Nice article – but you’re wrong to talk about parachute payments drying up at Cov. They were introduced after Coventry were relegated – so the club never received a penny from the Premier League to ease the burden of dropping a division. Decent effort to write an article like this, but as “an outsider looking in”, there are a lot of inaccuracies in this article.